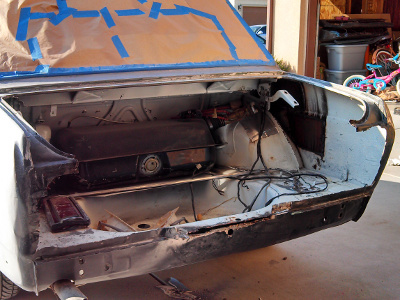 I've been dabbling with bodywork on my 510 for the last year, terrified at first at the idea of cutting up my beloved car and trying to patch it back together. However, after peeling through some of the nightmarish work that was done to the car by the previous owner, I figured I couldn't do much worse than what was already on it. 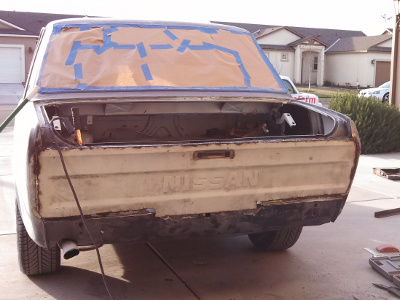 My first attempt was cutting out a stubborn dent that was "solved" by a monstrous glob of bondo. It's a little hard to tell what's going on there, but what you are looking at is a mountain of bondo covering a patch panel that went over the 510's gas cap filler hole. 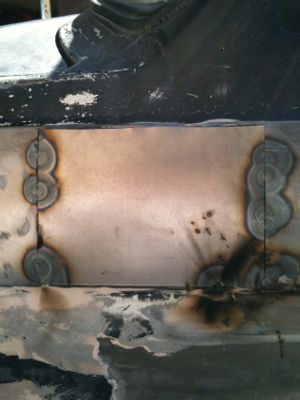 The previous owner shaved the gas hatch, and his metal work must not have been as good as he had hoped. That's a lot of bondo. 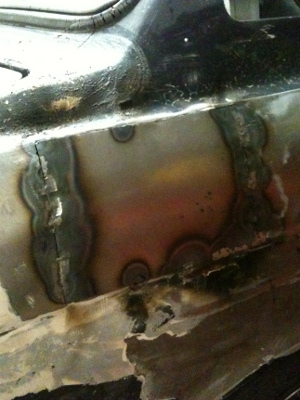 Before I had a decent MIG welder, I tried welding this up with my oxy/acetylene torch. I ended up getting it done, but oxy/acetylene is not the way to go when it comes to patch panels. I ended up picking up a great Hobart MIG welder and it's worked wonders. Another problem area was the entire rear panel. 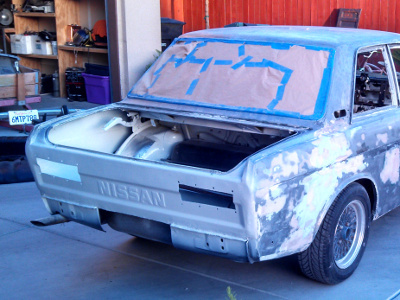 That picture above... it looks like sheet-rock, the bondo is so thick. 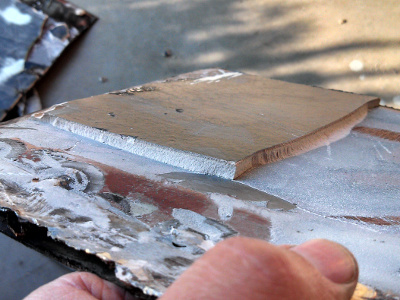 I tried cutting away the bondo to see where the metal began, and it just took too long. 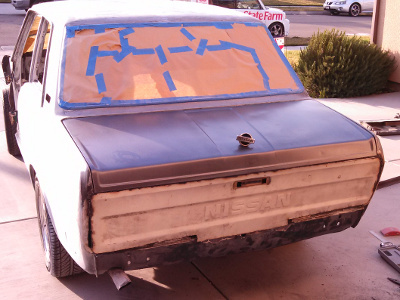 Unable to deal with all the bondo on the rear panel, I simply cut the panel off. It would be easier to start from scratch than to try to fix that mess. 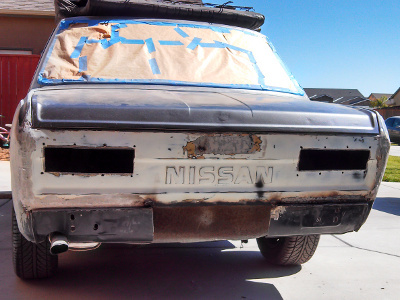 I've always liked the name "Nissan" more than "Datsun." 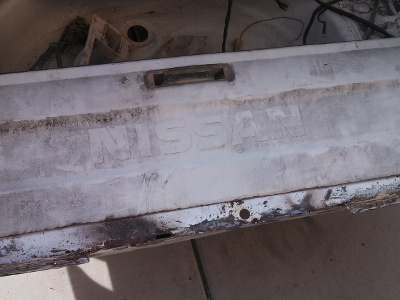 I managed to pick up this truck tail gate at the local pick-and-pull in Fresno. I also picked up a few Nissan badges to throw on the car. 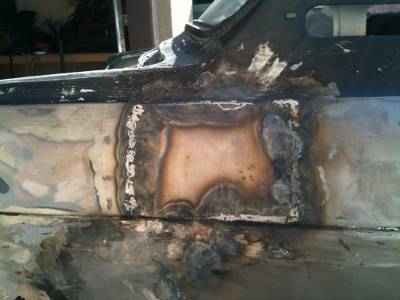 Here's the tail gate, skinned and tack-welded to the rear of the 510. Here is it fitted up with the trunk lid. Not too bad. 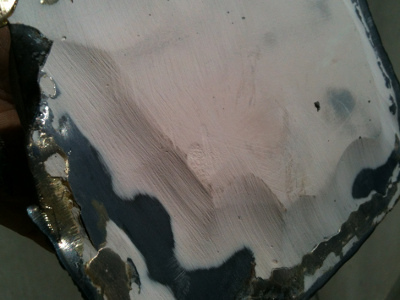 A little bondo work of my own (very little bondo), plus I've filled (with metal!) the spot where the tail gate handle once was. Filled and ready for smoothing out. 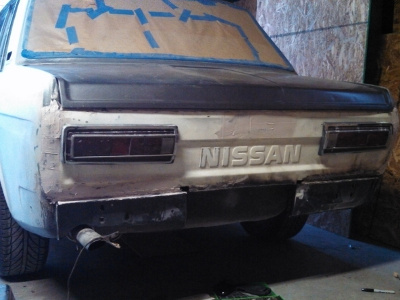 I've also set the tail lights in place for the picture. Smoothed out and primered. The rest of the car was also primered afterwards. It just needs paint, but it's basically done. 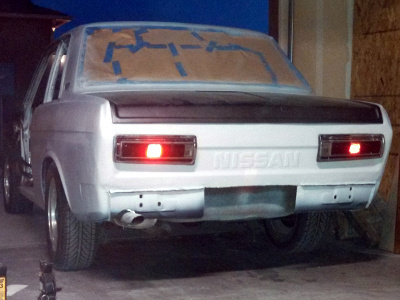 It's the first Nissan 510 tail panel.